BendPak’s GP-7LCS GrandPrix is truly in a class of its own, the shortest model in a series of three unique lifts. It's the first and only 7,000-lb. 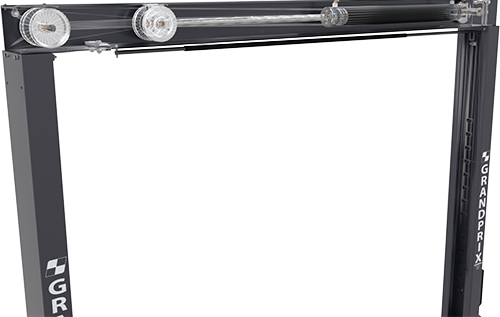 capacity two-post lift that features a stability-enhancing overhead beam while also fitting in a 9-foot high garage. This lift is sleek, slim and raises your vehicles up to a respectable 58 inches at the top lock. 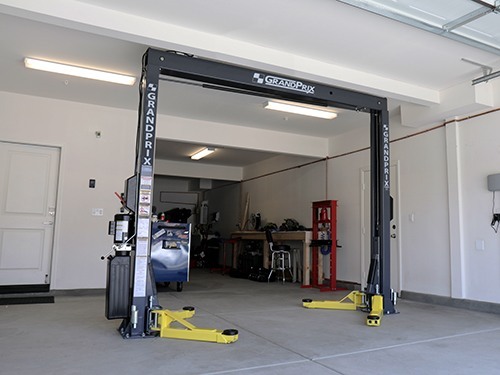 If you’ve dreamed of owning a full-size car lift at home, but worry that the other low-ceiling models don’t meet your standards for safety and quality, get ready to let the GP-7LCS change your life. As true innovators in the car lift industry, we know the difference between a small upgrade and a real game-changer. Until now, this type of lift has not been able to fit in a 9-foot garage. There have been other options (without a stabilizing overhead beam), but none that truly replace the function and reliability of a two-post lift. The GP-7LCS offers a clearfloor design and gets enough lifting height to let techs comfortably perform undercarriage work and wheel service. The overhead beam contains GrandPrix’s single hydraulic cylinder, as well as ​four wire ropes that run throughout the structure. Because the cylinder is stored in the overhead cross beam, we’re able to keep the side posts short and sturdy, using a minimal amount of steel. Since four aircraft-quality wire ropes assist with both lift and stabilization, the GrandPrix rises quickly and stays level at all times. In terms of safety, one of those wire ropes running to each column is redundant. In fact, it features twice as many steel lifting cables as other two-post lift and four-post lift models. This ensures that in virtually every single circumstance, as long as the lift is properly operated and maintained, failure in the form of uneven lifting or sudden drops is entirely eliminated. The backup cables are redundant; they're simply there to guarantee peace-of-mind at all times. Perhaps best of all, the overhead beam significantly improves stability, reduces the amount of maintenance you need to do over time and extends the life of your two-post lift. The GrandPrix philosophy is to improve garage safety and capability with a series of car lifts like no other. To prove this product isn’t just some clever marketing fluke, we went above and beyond on safety. 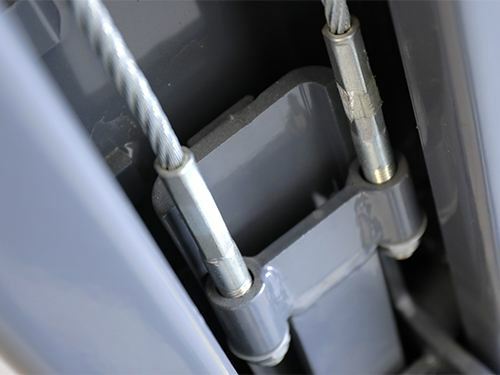 In addition to simultaneously engaging/disengaging, single-point mechanical lock releases, the dual wire rope system ensures the GrandPrix is as safe as any other lift when used correctly. In addition to all the incredible features mentioned above, no other two-post lift else has a 2:1 lift ratio in such a tight and streamlined package. That means the lift carriage rises two inches for every one inch of cylinder extension. Better yet, the GrandPrix gets additional lifting assistance from the wire ropes, which reduces fatigue on critical components and increases the lifecycle of the entire system. Utilizing this unique lifting combination raises your vehicles rapidly, safely and in a space-conscious manner. The only way to compare GrandPrix to other low-ceiling lifts is to look at other categories of lifts. Scissor lifts, for instance, are timed-tested auto lifts for garages with low ceilings. However, they often block the undercarriage of your vehicle, rendering them useless for many jobs. They’re not always the best solution if you’re looking to do full maintenance on your vehicles. Likewise, low-rise lifts are great for both wheel work and undercarriage service, but they usually don’t lift as high as the GrandPrix. That means you have to crawl under cars on a creeper or slide across the ground on your back, which may or may not be an issue. Since the GP-7LCS combines safer capabilities, a reduced footprint and ample lifting height, it's practically a miracle lifting solution. Unfortunately, we see it all the time: that look of disappoint when someone realizes they can’t fit a two-post lift in their 9-foot-high. We’ve been listening, and we’ve been secretly developing the GrandPrix for years. It took us that long to maximize its lifting height, minimize its ceiling clearance and ensure a fast, super-safe design. We think it’s been worth the wait for an extremely affordable yet uncompromisingly high-quality lift that ships right to your door. It’s a dream come true. The only question is... what do you dream of lifting? Let us know at story@bendpak.com.